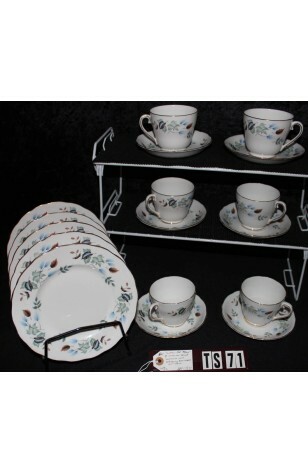 Vintage - Colclough Fine Bone China Cup, Saucer and Tea Plate Trio, Priced per Individual Trio Set. Purchase one Trio Set, or all. If still available, Just Select Set Quantity. Purchaser of the Last Trio Set, will receive an extra Cup and Saucer, at no additional cost, Circa 1939-1948. Shipping Weight is based on an individual Trio Piece Set. Colclough Bone China Tea Set Trio, in the "Linden" Pattern #8162, from the 1939-1948 period. This is a Lovely White Bone China, Encircled by a Band of Blue Flowers, with Green / Gray and Brown Leaves. All Pieces are Trimmed with 22kt Gold on Rims. Cups are also Trimmed on the Handles and Feet. A very Pretty Cup, Saucer and Tea Plate Trio, with NO chips, cracks or crazing. Vintage - Colclough Fine Bone China Cup, Saucer and Tea Plate Trio, Priced per Individual Trio Set. Purchase one Trio Set, or all. If still available, Just Select Set Quantity. Purchaser of the Last Trio Set, will receive an extra Cup and Saucer, at no additional cost, Circa 1939-1948. Shipping Weigjht is based on an Individual Trio Piece Set. Colclough Bone China Tea Set Trio, in the "Linden" Pattern #8162, from the 1939-1948 period. This is a Lovely White Bone China, Encircled by a Band of Blue Flowers, with Green / Gray and Brown Leaves. All Pieces are Trimmed with 22kt Gold on Rims. Cups are also Trimmed on the Handles and Feet. A very Pretty Cup, Saucer and Tea Plate Trio, with NO chips, cracks or crazing. In Great Resale Condition. 1 - Saucer - 5 1/2"